Users do not interact with the NetworkManager system service directly. Instead, you can perform network configuration tasks via NetworkManager's Notification Area applet. The applet has multiple states that serve as visual indicators for the type of connection you are currently using. Hover the pointer over the applet icon for tooltip information on the current connection state. After running this command, the applet appears in your Notification Area. You can ensure that the applet runs each time you log in by clicking System → Preferences → Startup Applications to open the Startup Applications Preferences window. Then, select the Startup Programs tab and check the box next to NetworkManager. 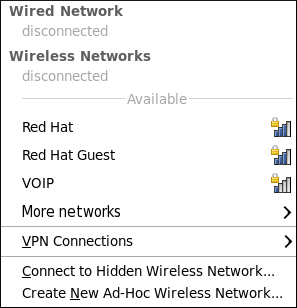 options for connecting to hidden or new wireless networks. If you are connected to a network, its name is presented in bold typeface under its network type, such as Wired or Wireless. When many networks are available, such as wireless access points, the More networks expandable menu entry appears.